VIPorbit for iPad available now for a limited-time discounted launch price. VIPorbit is a must-have app for mobile business professionals and salespeople alike, said best-selling author of Your iPad 2 at Work, Jason Rich. VIPorbit Software International, Inc., http://www.VIPorbit.com, today announced VIPorbit for iPad, the latest evolution of its full-featured mobile relationship management app, at SXSW. VIPorbit is the best way to manage contacts, calendar and communication (including social) all in one app, on the iPhone or iPad. VIPorbit for iPad includes signature features in the initial app designed for the iPhone, and some extras. In VIPorbit, contacts are integrated with the calendar, providing instant access to all relationship details, quick scheduling, and easy communication, including via social networks. A chronological log of all relationship activity is automatically created, providing users a comprehensive relationship history for each contact. Users can also record unlimited date-stamped notes for each contact. The app is designed around the concept of Orbits, allowing users to easily organize contacts into spheres of influence that can be leveraged to build relationships. The product is designed for contact-centric businesspeople such as entrepreneurs, business owners, salespeople, realtors, consultants and service professionals, including financial, legal, medical, etc. The app can be easily customized for any type of business. VIPorbit is led by co-founder and CEO Mike Muhney, who was the co-inventor of ACT!™, the best-selling contact manager from Contact Software International, a company he co-founded. With ACT!, the company created the contact management software category, a precursor to the booming CRM (customer relationship management) industry. Muhney is internationally regarded as expert on building business relationships and relationship management software. Muhney will be speaking at SXSW about how to build better business relationships on Tuesday, March 13 in Ballroom G at the Austin Convention Center. Session details available online. The talk will include a reading from his recent book, "Who's In Your Orbit? : Beyond Facebook, Creating Relationships That Matter." Autographed copies will be given as door prizes. The book can be purchased on Amazon.com in both paperback and Kindle versions. “If you are someone who needs to keep track of other people, VIPorbit is the best way to do it,” said Robert Scoble, tech evangelist and author of the popular Scobleizer blog. “VIPorbit is a must-have app for mobile business professionals and salespeople alike,” said Jason Rich, avid iPhone and iPad user, and best-selling author of "Your iPad™ 2 at Work." “VIPorbit gives you everything you need to stay on top your business relationships. It manages your contacts, schedule, tasks, email, social feeds, and more—all in one easy-to-use app. And, it’s affordable and available for the iPhone and now the iPad—two platforms widely used by businesspeople,” said Carmine De Santo, founder and publisher of i.Business Magazine. VIPorbit for iPad is US$19.99 and VIPorbit for iPhone is US$9.99. The products are both being offered at special 50%-discounted launch prices until March 31, 2012—VIPorbit for iPad for $9.99 and VIPorbit for iPhone for $4.99. VIPorbit Lite for iPad and VIPorbit Lite for iPhone are free versions limited to 100 contacts. All products can be downloaded from the App Store. For a guided tour of VIPorbit, watch the introduction video, "Build Relationship Value with VIPorbit for iPhone & iPad" on the VIPorbit YouTube channel. VIPorbit Software International, Inc. creates Mobile Relationship Management Software that helps businesspeople build sustainable relationships, which leads to greater success. 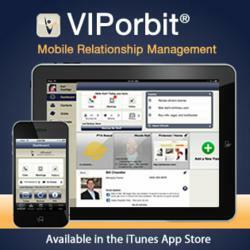 VIPorbit, is the only full-featured mobile relationship manager designed for the iPhone and iPad. From the co-inventor of ACT!, it provides mobile professionals with an affordable, easy-to-use, anytime/anywhere solution that allows them to deal with more people, more effectively, elevating the value of their relationships. Visit http://www.VIPorbit.com for more information, and follow the company at http://www.facebook.com/VIPorbit, @VIPorbit on Twitter and http://www.linkedin.com/company/viporbit.